After much struggle to select a microcontroller and programming system for teaching programming to my 5th grade club, everything suddenly came together. 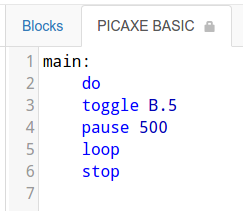 In a flash I remembered PICAXE, which are low cost BASIC-programmable microcontrollers. 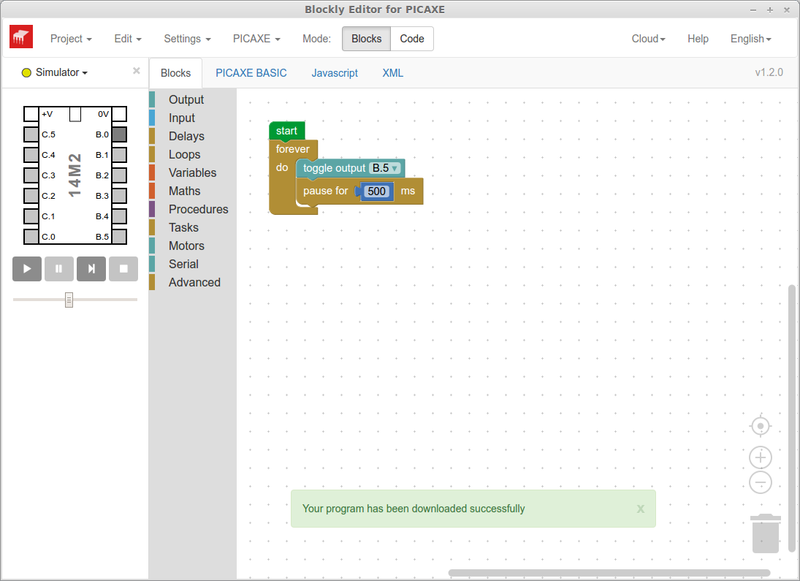 Even better, since all the kids have Chromebooks, PICAXE can be programmed with a Chrome App using the Google Blockly graphical programming framework. As pointed out by my SHARC pals during a lunch discussion, 5th graders aren't expert typers so this kind of graphical block system sidesteps a lot of frustration. And I feel this system is better suited for robotics than native Scratch is. 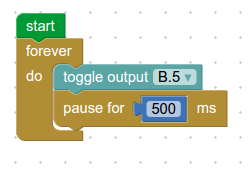 The PICAXE Blockly IDE has some neat features. First, the IDE includes a simulator so kids can run their code safely before trying it on the robots. Second, they can see the BASIC language program by clicking a tab so they can get an introduction to standard programming languages. 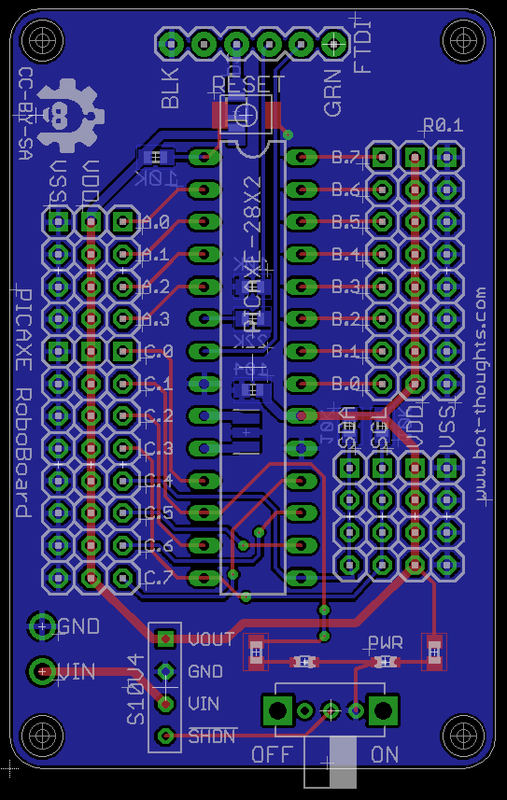 My sample PICAXE-14M2 is now successfully blinking an LED on pin B.5. Soon I'll be prototyping motor control using the Pololu DRV8835 driver breakout boards I bought during the Black Friday sale. 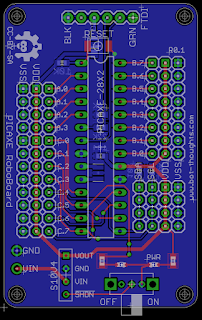 And, I'm almost done designing a baseboard, similar to my PIPduino, that uses a Pololu step-up/step-down regulator (S10V4F5) for power, also a Black Friday purchase. 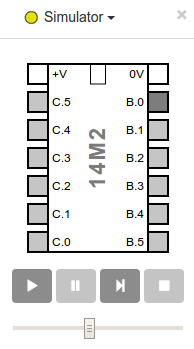 Since the PICAXE programmer cables are too costly for our budget I'm going to find or make cheap FTDI breakout boards or else put an FTDI and USB connector onboard. It feels good to have finalized the MCU and programming system for the kids' robots. I'll order the baseboards soon and hopefully I won't have screwed up anything so we can get started programming in 2-3 weeks.